Travel-loving iPhone owners on T-Mobile's network will soon be able to text and access data for free worldwide, as the carrier has announced a new free international data coverage feature set to launch at the end of October. T-Mobile confirmed the new roaming offer Wednesday evening, revealing that its Simple Choice customers will now have access to unlimited roaming data and texting in more than 100 countries. For voice calls, the carrier will charge a flat rate of 20 cents per minute when roaming, with no additional monthly fee. T-Mobile also confirmed to AppleInsider that iPhone owners can take advantage of the global roaming service, as can any other Simple Choice customer with a quad-band smartphone. Early on Wednesday, T-Mobile chief executive John Legere hinted at the announcement in a tweet, saying the carrier was about to "change the way the world uses their phones." The "UNcarrier" also teased the unveiling of free data coverage initially in an image uploaded to its website, with an additional image appearing soon after on the ShakiraMega Facebook page. That latter image revealed T-Mobile's other announcement: that global pop star Shakira had joined in a multi-year collaboration agreement with the carrier to aid in the "creation of unique content, fan engagement," and other promotional activities. 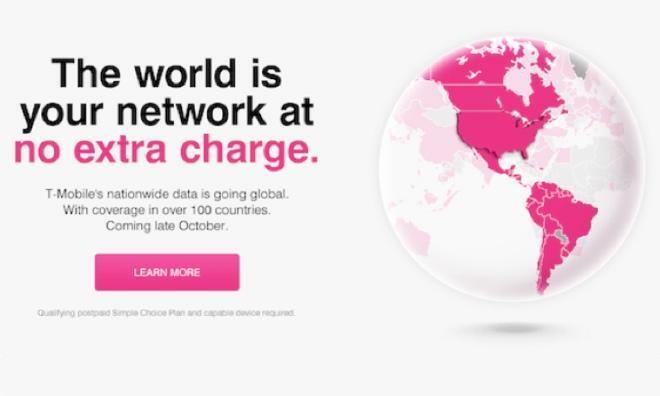 T-Mobile's own promotional image appears to show international coverage extending across North and South America, as well as much of Europe and portions of Asia. The carrier also noted that its 4G LTE network now covers 233 metro areas across the United States. T-Mobile's high-speed data coverage can now reach more than 200 million people. Long rumored as a possible acquisition target for any of the three larger carriers, T-Mobile was on the verge of being bought by AT&T a short time ago. Since that deal fizzled, though, the carrier has been rejuvenated, due in no small part to its carrying Apple's iPhone, a development that occurred earlier this year. Recent market figures indicate that the launch of the iPhone on T-Mobile's network in April led to the carrier's share of smartphone sales in the United States growing 1.1 percentage points to 13.2 percent. The recent launch of the iPhone 5s and 5c on that network may boost T-Mobile's share even further. The company's resurgence is also owed to its novel wireless plans, some of which allow customers to get new phones with no money down or to upgrade on a faster time sale than the typical two-year contract allows. Those T-Mobile programs have led to other carriers quickly launching their own similar features, giving customers the option to upgrade early or to sign up for no-contract deals.